The common way of arriving to Russia is an air flight. You can get to Russia by regular flights and charters of world’s biggest carriers as well as discounters, from all European capitals, New York, Washington and Los Angeles in the USA, Beijing, Tokyo, Hong Kong, Singapore, Delhi, etc. Main tourist traffic goes through 3 international airports (Domodedovo, Vnukovo and Sheremetyevo) in Moscow and Pulkovo in Saint-Petersburg. All these airports have been recently renovated according to the international standards. There are international airports in other Russian cities as well. The biggest Russian air carriers are Aeroflot, S7, Transaero, Pulkovo airlines. Other ways of arriving to Russia are by train, by ferry or by tourist bus. Moscow has regular train connections with Helsinki, Prague, Berlin, Warsaw, Budapest, Kiev, Minsk, Riga, Vilnius, Tallin. Main railway stations in Moscow are Leningradsky, Yaroslavsky and Kazansky located nearby on one square, Belorussky, Kursky and Paveletsky. All of them are located in the center of the city. In Saint-Petersburg there are Baltic, Finlandsky, Moscovsky, Ladogsky stations. Ferry lines connect Saint-Petersburg with Sweden, Finland, Norway, Estonia. Bus terminal connects Saint-Petersburg with Helsinki, Tallin and Riga. For short trips from major cities to the nearby towns, bus is the most convenient mean of transportation. For long-distance trips it is advisable to use train services, provided by Russian Railways, a government-owned railway monopoly. The company is one of the biggest railway companies in the world with 1.2 million employees. Compartments with 4 beds provide comfort and secure journey and can be booked in advance. 2 bed-compartments are also available. Most Russian cities have well-developed and diverse systems of public transportation. Tickets are required for buses, trolleybuses and train journeys. One ticket must be validated for each journey. It is best to purchase tickets prior to boarding, but they can also be purchased directly from the driver while boarding. If you need to get a taxi you can either order it from your hotel or hail in the street. Taxis are normally yellow with chekers. The fastest public transportation in the cities is Metro. The Moscow Metro opened in 1935, now it is the most popular kind of transport used by approximately 9 million passengers. The major advantage of Moscow metro is a good combination of reliability, comfort and transportation speed which is crucial, assuming the close conditions and the pace of life of the modern metropolis. Every day 9915 trains run over 12 lines of the system (~300 km and 180 stations) with the minimum headway of 60 seconds and less during peak-hours. The Moscow Metro is well known for it’s outstanding design of halls and stations. The Moscow Metro use magnetic contact cards for tickets with a fixed number of pre-paid journeys (1, 2, 5, 10, 20) with small discounts starting with 5-ride cards. 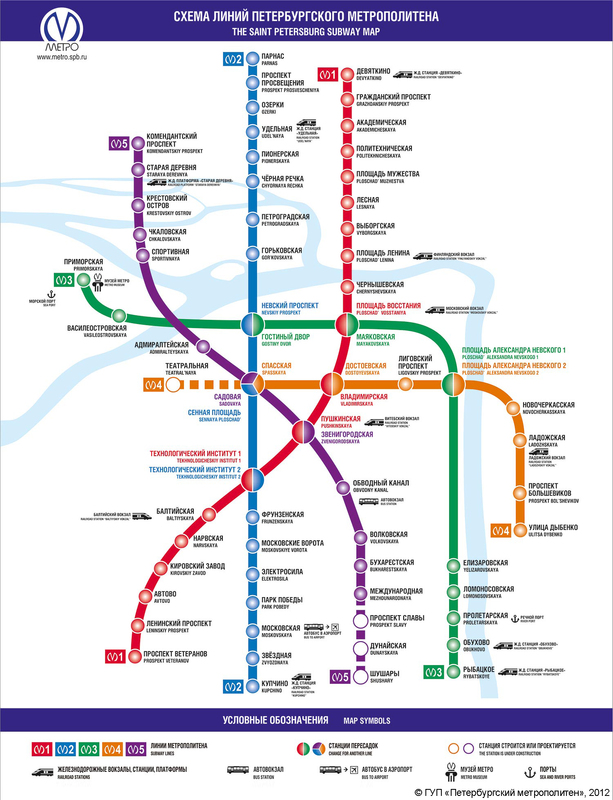 Metro systems also operate in Saint-Petersbourg (5 lines, 63 stations), Novosibirsk (2 lines, 12 stations), Nizhny Novgorod (1 line, 13 stations), Samara (1 line, 8 stations), Yekaterinbourg (1 line, 8 stations), Kazan (1 line, 6 stations). Metro systems are under construction in Omsk, Krasnoyarsk, Chelyabinsk.